The thick, juicy leaves of Aloe contain two distinct products used medicinally and are important to be distinguished for the purposes of caution and to avoid confusion. a thin clear gel or mucilage that oozes from the middle of a broken leaf. 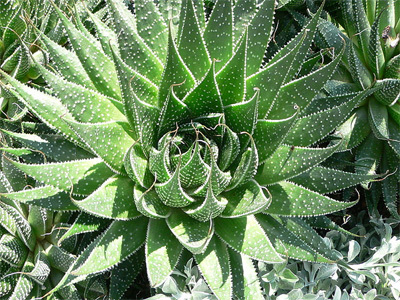 a bitter latex, referred to as aloe vera juice, derived from the cells just under the surface of the leaf. Their compositions and uses differ. The active ingredient in the gel is mucopolysaccharides. The latex provides anthraquinone derivatives, mostly in the form of aloins, with smaller amounts of hydroxyaloins, aloe-emodin, and aloeresins.